On 23 February 2018, in light of significant liquidity strains, the European Central Bank (ECB) and the European Single Resolution Mechanism declared ABLV Bank, formerly Latvia's third-largest bank with a 13% market share in terms of assets, "failing or likely to fail" and ordered its closure. The Latvian bank's ability to meet its financial obligations was significantly compromised after it suffered large deposit withdrawals prompted by the US Department of the Treasury's allegations on 13 February that the bank was facilitating a breach of US sanctions against North Korea through largescale money-laundering operations. ABLV Bank has denied these allegations. Money-laundering allegations against ABLV Bank along with separate bribery allegations against the governor of the central bank, Ilmārs Rimšēvičs, has triggered a regulatory overhaul in Latvia. These regulatory reforms are expected to change the structural profile of the banking sector. Non-resident-focused banks, smaller commercial and private banks servicing mainly non-resident customers, will have to shift strategy and implement new business models, encouraging banking sector consolidation. In April 2018, Latvia undertook a first initiative towards tightening the country's Anti-Money Laundering/Combating the Financing of Terrorism (AML/CFT) regulatory framework when Parliament adopted a law forbidding banks from servicing shell companies, which are believed to be used primarily for money laundering purposes. The bill, gave banks 60 days from 9 May to break their current business ties with such companies. It is likely that these companies rushed to retrieve their funds from the Latvian banking sector, upon threats that they would be blocked and their withdrawal subject to regulatory checks following the end of the transition period. 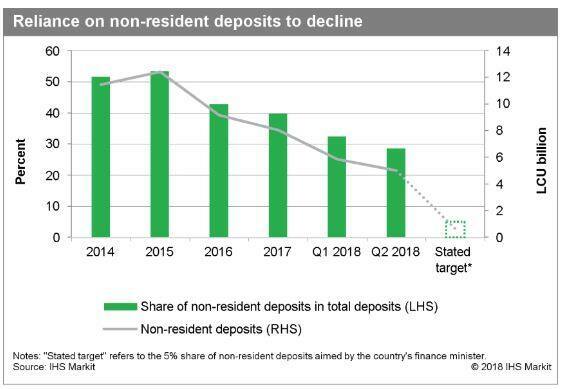 Non-resident deposits declined by almost 38% in the first half of 2018, driving the total deposit base down by around 14%. Further initiatives to reduce the sector's reliance on non-resident deposits are expected in the near term. Latvian Finance Minister Dana Reizniece-Ozola has publicly stated a goal of reducing the share of non-resident deposits to just 5% of total deposits, from almost 29% in June 2018 and 40% in 2017. Reaching this target would imply additional deposit outflows totaling EUR4.3 million, equivalent to one-fourth of the sector's total deposit base as of mid-2018, assuming a stable domestic deposit base. Although significant for the sector as a whole, non-resident-focused banks are likely to suffer the most, in some cases threatening their financial stability and longer-term viability. However, banks known for their domestic focus are unlikely to suffer deposit outflows. In fact, resident-focused banks could even be viewed as safe havens given their very small reliance on non-resident deposits. The resilience of the largest banks significantly mitigates potential spill-overs to the entire banking sector. 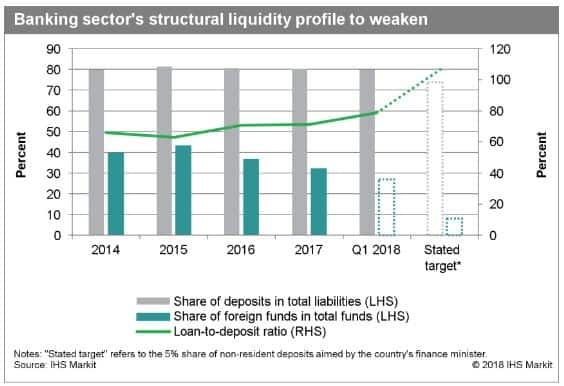 Reducing the share of non-resident deposits in total deposits to the authorities' 5% target would imply an additional 26% decline in total deposits, assuming stable resident deposits, significantly stretching banks' structural liquidity position. According to our calculations, all else being equal, the share of deposits in total liabilities would decline from 80% in 2017 to 72%. The loan-to-deposit ratio would increase from 79% in March 2018 to 110%, after already increasing by almost 8 percentage points in the first quarter of the year. It is likely that the gap between the large resident-focused banks' and non-resident-focused institutions' structural liquidity profile will deepen. Members in the former group are likely to be viewed as safe havens by domestic depositors, strengthening their deposit base and their structural liquidity position. Among these are the country's three largest banks - Swedbank, SEB banka, and Luminor Bank - which jointly hold 48% of assets and 54% of deposits. However, smaller, non-resident-focused banks are likely to experience sharp asset deleveraging as liquidity conditions tighten and will be forced to revise their business model as it becomes obsolete. Ten banks report more than half of their deposits are foreign, including six banks with more than 86% of their deposits coming from non-residents. These 10 institutions represent 30% of banking sector assets in aggregate and hold around 90% of total foreign deposits according to IHS Markit calculations. The regulatory initiatives to reduce reliance on non-resident deposits is likely to undermine these banks' ability to operate under their current business models. Non-resident-focused banks submitted to the regulator (Financial and Capital Market Commission: FCMC) strategic plans to pursue their activities without reliance on shell companies for funding and, to a larger extent, non-resident deposits. Such plans likely involve an activity shift towards commercial banking activities and funding shifts towards domestic depositors. As banks' business models become more homogeneous towards traditional commercial banking activities, competitive pressure and increased cost structure most likely will force consolidation of players. Non-resident-focused banks could merge with peers, turn into non-bank financial institutions, or relocate to a formal offshore banking sector, for example. Following recent initiatives targeting banking operations with shell companies, we expect significant additional tightening of the Latvian AML/CFT framework in the near term. The parliamentary majority led by the center-left Union of Greens and Farmers (ZZS) is likely to adopt amendments aimed at tightening banking regulation. There is a relatively broad consensus within Latvia on the need to comply with international anti-money-laundering standards in light of the US Treasury Department's allegations against ABLV Bank from February. The financial regulators, the ministry of finance, the Association of Latvian Commercial Banks, and experts from the non-profit sector have proposed more than 20 measures aimed at enhancing the stability of Latvia's banking sector. Among others, these include measures to enhance information-sharing among financial institutions and between financial institutions and authorities. These initiatives also will support a stronger supervisory framework. Given the cross-border aspect of money-laundering operations, it is likely that European authorities will need to harmonize the AML/CFT framework across European Union countries, or at least the Eurozone, and increase communication and cooperation among local regulators and the ECB. The expected regulatory overhaul and change in the banking sector's structural profile will help to rebuild trust in Latvian banks, after it has been severely hurt by the ABLV Bank case. While these efforts come at an economic cost - the International Monetary Fund has estimated that the outflows of non-resident deposits will cost Latvia between 0.5% and 1.0% of its GDP growth per year - reforms most likely will have long-term positive effects on the country and its banks' reputations. Wider efforts to rebuild trust in the European Union's banking sector also will be needed as the ABLV Bank case has revealed several regulatory and supervisory loopholes. In particular, recent events have highlighted discrepancies in the repartition of powers between European and local regulators, which will need to be tackled to ensure the stability of the European banking sector and the sustainability of a banking union.